Updated news and notes on the Mariners and all things baseball from the MLB winter meetings at the Mandalay Bay in Las Vegas. The Mariners have received multiple trade offers on All-Star outfielder Mitch Haniger over the last week to 10 days. And that will continue until teams like the Braves and Nationals finalize their outfield situations. General manager Jerry Dipoto has said they would have to be blown away by a trade offer to move Haniger. That has yet to happen. 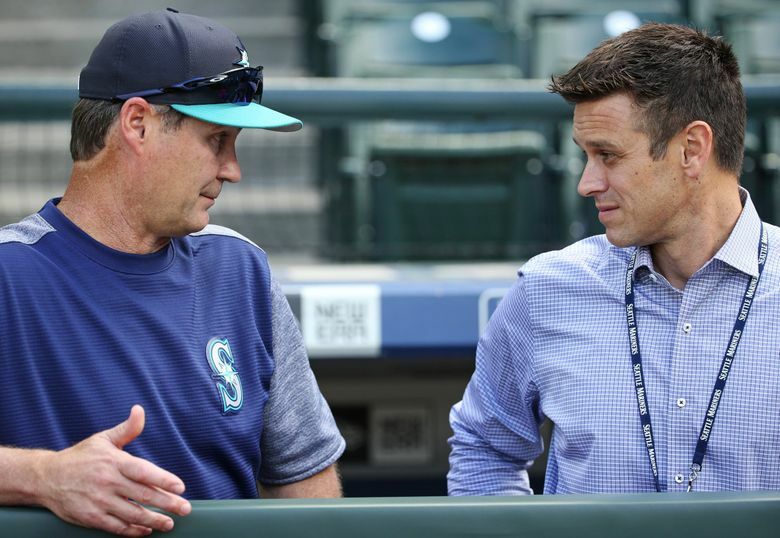 Sources indicate that the Mariners are willing to listen, but they want a sizable player/prospect return of three to four players, including two high level prospects, including a pitcher. Dipoto makes that very clear when meeting with teams. He won’t stipulate the exact aspects of a return. But just an idea of what they are looking for. Seems like a logical way to approach things. Haniger is coming off a breakout season. He was Seattle’s most productive hitter for most of the 2018 season. With a mature approach and a relentless attitude toward preparation, he hit .285 (170 for 596) with a .366 on-base percentage, a .493 slugging percentage, 90 runs scored, 38 doubles, four triples, 26 home runs, 93 RBI and 70 walks in 157 games. After injuries hampered him in 2017, Haniger played in more games than any other Mariners player in 2018 while making just $560,000. Haniger will make around that total next and then have three years of arbitration eligibility before reaching free agency in 2022. At age 27, Haniger is a late bloomer and will be in his 30s before he reaches free agency. The Mariners could buy out his arbitration years and his first year of free agency with an extension, but they might be wise to wait at least another season before making that decision. Given his production, work ethic and low cost, Haniger is certainly attractive to any team, but playoff contenders that are flirting with the luxury-tax threshold see value in adding a player such as him where they get All-Star production and a reduced rate. “We see Mitch as a late bloomer,” Dipoto said. “He’s an athletic guy. He represents everything we would like to gear ourselves toward. He is an example of how we want our players to think about the game, how we want them to prepare for the game. The fact that that he’s turned into such a good player is gravy. Multiple MLB sources don’t expect first baseman/designated hitter Carlos Santana to ever put on a Mariners uniform. Santana was acquired along with shortstop prospect JP Crawford in the trade that sent shortstop Jean Segura and relievers Juan Nicasio and James Pazos to the Phillies. But sources indicate that the Mariners will flip Santana for some prospects. Rockies general manager Jeff Bridich told reporters on Monday at the winter meetings that they were interested in working for a trade with the Phillies for the switch-hitting Santana to play first base. The Mariners have an opportunity to work a deal with the Rockies. But Seattle shouldn’t limit itself to just the Rockies. Unlike Segura, there is a market beyond the one team. The Twins, Astros and Rays also have needs for first base/DH types. Sources said all three teams have interest in signing Nelson Cruz. The Mariners could wait till Cruz picks a destination and then shop Santana to the other two teams along with the Rockies. A Twitter report that Cruz had narrowed his choices to Tampa and Minnesota was quickly shot down by Cruz’s agent, who said there are multiple teams still involved. Santana does present more roster flexibility. He’s a better than average defender at first base so he isn’t limited to only a DH role. The Mariners will almost certainly have to eat some payroll in any deal involving Santana. Per Cot’s contracts, he’s owed $17 million in 2019, $17.5 million in 2020 with a $500,000 buyout for a $17.5 million club option in 2021. A team like the Rays won’t take on his full contract. But the Mariners have money with so much payroll coming off with the trades of Segura, Robinson Cano, Nicasio and even James Paxton and Mike Zunino. Dipoto confirmed that the experiment to play Dee Gordon in center field has expired. With Robinson Cano being traded to the Mets in the offseason, Gordon will go back to second base with the hope that he’ll have a bounceback season after disappointing 2018 season. Gordon posted a .302/.327/.392 slashline with 10 doubles, two triples, a homer, 13 RBI and 16 stolen bases. But after fracturing his right big toe on a foul ball on May 9, the injury lingered for the remainder of the season, bothering him at the plate and on the bases. In the final 95 games, Gordon posted a .251/.268/.327 slash line with just 14 stolen bases and 10 caught stealings. The Mariners decision to bounce him from position to position when Robinson Cano returned from a suspension also was an issue. Gordon was clearly uncomfortable with returning to the outfield after playing at second base in Cano’s absence. GM Jerry Dipoto said the Mariners would look at possibly adding a right-handed hitting outfielder via free agency. It could be a veteran player on a minor league sign with an invite to camp. Looking at the Mariners projected outfield, they have Mitch Haniger starting in right field, Mallex Smith in center and Jay Bruce or Ben Gamel in left field. Smith, Gamel and Bruce are all left-handed hitters. Obviously, Bruce will see some time at DH and could also play first base. But just for simple day-to-day lineup construction, a right-handed hitting outfielder could be useful. Given the Mariners’ expectations, the outfielder would logically need to be able to play centerfield at capable level. A veteran like Rajai Davis or even a reunion with Austin Jackson could be a possibility. The Mariners have right-handed hitting outfielder Braden Bishop and John Andreoli on the 40-man roster, but both are expected to start the season in Class AAA Tacoma. A day without trades is like a day without sunshine. If the Mariners do make any sort of roster moves, it seems likely that it would be to sign a free agent reliever to fill some glaring needs on their roster. Closer Edwin Diaz, set-up man Alex Colome and middle relievers Juan Nicasio, James Pazos and Nick Vincent are all gone off the roster. But don’t expect the Mariners to look at established closers or set-up men like Kelvim Herrera, Andrew Miller, Adam Ottavino, Greg Holland or Cody Allen. That doesn’t fit with their current stepback plan. But it wouldn’t be surprising to see Dipoto sign a few decent arms to short-term contracts and then move them at the deadline if they’ve increased their value. Seattle will also look to sign relievers that are coming off of injuries or sub-par years to one-year contracts in hopes of bounceback production and a possible midseason trade. A pitcher like David Phelps would definitely be a candidate. But these signings would likely come later in the offseason.